Natalie is a mobile beauty therapist and set up her business “Beauty by Nat” in 2013 from her base in Sunbury on Thames. 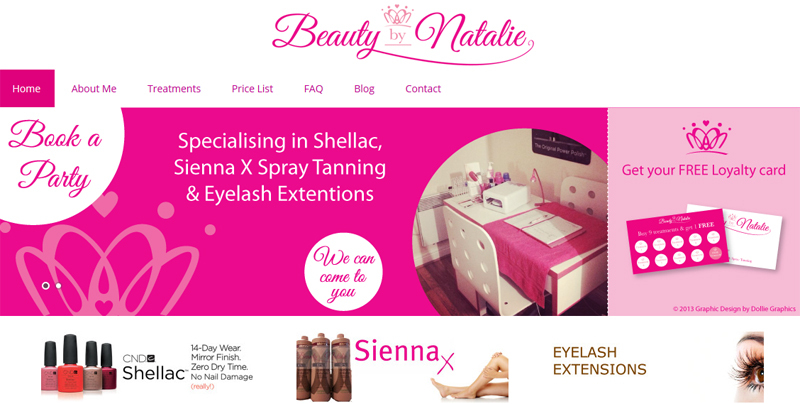 Natalie wanted a responsive website that showcased the treatments she specialises in including Shellac, Sienna X spray tanning and eyelash extensions. As the business grows, Natalie’s website is designed to grow with her and has been built using the WordPress platform using one of my favourite Studiopress templates. As a website specialising in female beauty treatments the site is suitably pink in colour! As a great deal of business is local and has grown from word of mouth recommendations, there is also links to Natalie’s Facebook and Twitter accounts on the home page. Logo and graphics designed by Dollie Graphics. 50 Shades of Mum is one of my personal projects that I set up and created as a Mummy blog to chart life as a Mummy to a 3 year old little boy. The blog has now progressed into a pregnancy blog! As well as charting the highs and lows of a work-from-home Mum, I’m also writing about pregnancy updates and the differences between giving birth in Spain and the UK. Visit the site and follow the blog updates at www.50shadesofmum.co.uk.